Rockweiler Team Member Receives National Honor from Owens Corning. 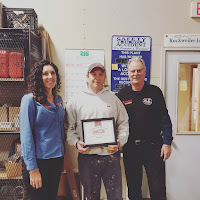 Rockweiler Insulation is proud to announce that team member Aaron Calvert has been selected as a recipient of the Owens Corning ExCEEd on the Job Award. Aaron is one of two insulation installers who were recognized nationwide. As part of the Owens Corning Certified Energy Expert program, ExCEEd on the Job recognizes installers four times per year. Recipients are chosen based in part on their to quality and going above and beyond to ensure excellence with each project. As a quarterly award winner, Aaron is eligible for the annual prize which includes a $1,000 gift card and an all-expenses-paid trip to Owens Corning’s National Certified Energy Expert Meeting. The meeting will be held in May 2017 in Scottsdale, Arizona.